written by and posted courtesy of Francis Pratt. esplanade that today runs along its north-east facing side (see footnote). It was ready in 1622, just in time to impress King Louis XIII who stayed there on his way to deal with a Protestant uprising that had occurred further South, stimulated by the failure of the local Catholics to keep faith with the Edict of Nantes which had legally guaranteed freedom of worship for the Protestants. A main reason why the new esplanade took so long to put in place was that previously there had been a steep escarpment, sloping precipitously down from the town’s then massive ramparts. It is difficult to imagine the quantity of earth and rocks that must have been moved to raise the ground level. Today the original rampart walls are seldom visible, for houses have been extended beyond them and what used to be formidable slopes are hidden by flat places at the level of the esplanade and of various roads below. All these additions were great works made possible by men using buckets, wheelbarrows and oxen-drawn carts to move what must have seemed to them to be mountains of stone and earth. If we imagine Castelnau de Montmiral before these heroic efforts, we realise that it would have been surrounded on three sides by natural defences of a kind that would have made any enemy think twice before attempting to attack it. Clearly its founder Raymond VII Count of Toulouse was intent upon creating a formidable fortress town when he founded it, along with Cordes sur Ciel, in or around 1222. This was the year in which he succeeded his father Raymond VI, during a short period of respite in the fast failing fortunes of his still powerful family. The most pressing reason for building these two strongly fortified towns was a consequence of disputed territorial claims. It was only very recently that Raymond had joined with his father to win (they would said “reclaim”) by force the territory known as the Northern Albigeois (see map), in which the two projected towns were be be situated. A first consequence of this military activity was that Raymond was under active threat from those that he and his father had so recently dispossessed. But this was not all. Both in the short and the long term, he had reason to fear interventions from an unusually large number of rival claimants to overlordship, including the Pope, the Trancavel family, The Kings of Aragon and the Kings of France. To clarify the situation it is necessary to go into more detail. In 1209 Roman Catholic Pope Innocent III called for a crusade against the Cathar heretics who had established a strong presence in South-West France. At this date the de facto overlord of the Albigeois (roughly corresponding to the Tarn region of today) was Raymond-Roger Trancavel. He was also Viscount of Carcasonne and of Bessières, a title which extended his domains to include a large part of what is now the Department of the Aude and beyond. 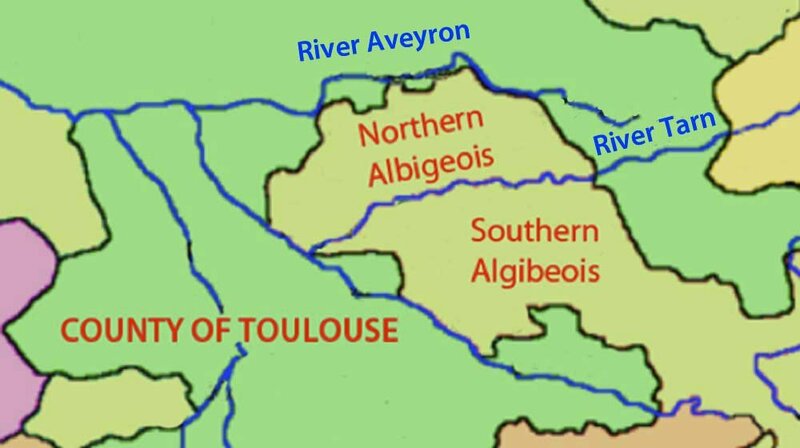 However, there had been a long running dispute between the Trancavels and the Counts of Toulouse concerning the seigniorial rights over the Northern Albigeois, the part of the Trancavel territory that lay between the rivers Tarn and Aveyron (see map). Raymond-Roger was notorious for his support of Cathar sympathising subjects (his wife was said to be a Cathar) and it is not surprising that his domains were the first target of the crusaders. Very early in the campaign Raymond-Roger himself was taken prisoner and soon after died in captivity. At this juncture, feudal custom dictated that a seneschal (temporary governor) should be chosen to rule over what had been his territories during the minority of his young son. The crusaders took this task into their own hands, which was a provocative decision since, according to feudal custom, the choice would have been more correctly made by one or other of several candidates higher up the feudal hierarchy, including Pope Innocent III, Pierre King of Aragon and Phillipe August King of France. Turning a blind eye to the highly risky implications of these feudal/religious complexities, they selected Simon de Montfort, an able military leader, under whom they started the process of clearing the entirety of the Trancavel lands of Cathar-sympathising lords (who once ousted were known as the “Faydits”) and dividing up their domains amongst themselves. However, the crusaders had set about their work without consulting Pierre, King of Aragon, Raymond-Roger’s chosen royal overlord and one of the men whom had superior right over the question of choosing the seneschal. They can hardly have been surprised when he took umbrage and joined forces with Raymond VI of Toulouse with a view to asserting what he saw as his royal rights on the field of battle. However, his objective was not achieved for Simon and the crusaders were victorious at the Battle of Muret, leaving Pierre dead and Raymond much weakened. It was a victory that left the crusaders free to continue the work of ousting and replacing the Cathar sympathising lords throughout the Trancavel lands, including those residing in the Northern Albigeois. After this process had been completed, Simon, with the enthusiastic support of the Pope, turned his attention to the cleansing of heresy beyond the borders of his governance as seneschal, starting with regions within the domain of Raymond VI of Toulouse. According to very deeply held conventions of Medieval land governance, this was a rash decision. Whereas, after the defeat of Pierre of Aragon and Raymond VI of Toulouse, Simon’s legal entitlement to do more or less as he wanted in the territories over which he been chosen seneschal had never been seriously contested (except by the Faydits). However, his right to act in the same way in the domains of the Count of Toulouse was very much more questionable and his incursion into them was seen by the local nobility as highly provocative and worrying. Where would it all end? In their view it was a blatant case of an upstart usurping the acknowledged role of the incumbent Raymond of Toulouse to whom they now gave their support. In important part due to this abuse of feudal convention, Simon’s campaigning began to run out of steam. Although his prowess as a military leader sustained him for a while, it was not to be long before he met his death while conducting a siege of Toulouse in 1218. Meanwhile Raymond VI, who had been joined by his now adult and able son, the future Raymond VII, was well on the way to reestablishing his family’s power. A region to which the two Raymonds gave particular and successful attention was the Northern Albigeois where they ousted the crusaders, reinstalled the Faydits and set about establishing their authority. Although there are no records to prove it, there can be little doubt that the reinstated Faydits would have sworn oaths of fealty to Raymond and given an undertaking that they would support his family in their claim to overlordship over the Northern Albigeois. It is at this juncture that we can return to the reasons for the foundation of the fortress towns of Castelnau de Montmiral and Cordes sur Ciel. The first of these was the threat posed by the recently ousted crusaders who were far from admitting permanent defeat and at the time still maintained footholds in the Northern Albigeois (for example, just across the river Tarn from Albi, where Simon de Montfort’s son Philippe was installed and, significantly, where Raymond’s right hand man, Sicard Alaman, would later build Castelnau de Levis). Naturally, they would be keen to do all they could to get back what they had come to believe to be their rightful possession. Nor were their prospects without hope for they could rely on the help of those of their crusader colleagues who had settled more securely in the Southern Albigeois and the counties of Béziers and Carcassonne. They might also persuade King Louis VIII of France to come to their aid on the basis of both crusading and territorial arguments (Louis was keen to establish his overlordship in the disputed territories). Clearly, it was in the Faydits and their new overlord’s interest to defend themselves against these threats. The building of two fortress towns was a logical next step. But there was another twist to the situation, for one of the contributing factors to the decision to launch a crusade in the first place was the general weakness of top-down feudal authority in the region, a state of affairs which may explain Raymond VI’s inability to fulfil his promises to abide by the pre-crusade injunction of Pope Innocent III that ordered him to rid his territories of Cathar sympathisers. The local local lords refused to cooperate. Now his son found himself in the position of having helped these same unbiddable lords to resettle in the Northern Albigeois and could be excused for wanting to find ways strengthening his authority over them. Clearly the existence of fortress towns over which he had more direct control would help in this respect. Accordingly the inhabitants of Castelnau de Montmiral and Cordes sur Ciel were given charters by which they acknowledged the overlordship of Raymond VII in return for exemptions from local feudal dues. In this respect, Castelnau de Montmiral and Cordes sur Ciel, were precursors of the bastide movement which got under weigh very soon afterwards in other parts of the County of Toulouse. A significant difference was that the bastide towns virtually all came into being after the signing of the Treaty of Meaux in 1229, one of the main purposes of which was to adjudicate on landowning questions, not least the hotly disputed ones relating to the Northern Albigeois. By this time the power-game involving kings and counts had shifted significantly in favour of the young Louis IX (later known as St Louis) and against Raymond VII of Toulouse who was forced to cede his eastern provinces to Louis IX of France, the Marquisat de Provence to the Pope and those parts of the former Trancavel lands that lay south of the river Tarn to the crusaders. However, there was compensation for Raymond as the treaty confirmed his rights (as well as those of the reinstalled Faydits) in the Northern Albigeois (and therefore to the new fortress towns of Castelnau de Montmiral and Cordes). Opportunities for the profitable development of virgin land. Work for the unruly bands of unemployed, hungry and desperate vagrants who had been causing widespread disruption. Wealth for the newly installed market-town communities and local landowners. Improved top-down control for the Count of Toulouse and his recently acknowledged overlord the King of France. In short they were conceived as engines of economic growth and social management, not as fortress towns, as was the case with Castelnau de Montmiral and Cordes. The extremely complex events touched upon above reveal a deeply unstable situation and many different reasons why, immediately upon his succession, Raymond VII would have wanted to shore up his authority by building fortress towns. The most immediate of these was to provide centres of defence to deter the return of the ousted crusaders, coming from the south. Another reason, also mentioned above, was to strengthen his authority over the newly reinstated Cathar-sympathising lords. A third, more distant one (because the Trancavel claimant was still only a child), was to resist any future attempt by the Trancavel Family to lay claim to what they considered to be their territory. A fourth, was to strengthen his position should he feel the need to take sides in any future disputes involving royal overlords whether Spanish, French, English or ecclesiastical. In particular, a potentially imminent threat that could not be ignored was the possibility that the very religious Louis VIII of France would take action both to help the dispossessed crusaders and to assert his own claims as royal overlord of the Trancavel lands including the disputed territory to the North of the Tarn. Unfortunately for Raymond VII, the feudal powers of the King included the right to summon his vassals to support him in battle, so when Louis came down with an army Raymond VII found himself isolated and in no position to do anything else but capitulate. Luckily from Raymond’s point of view, the King died in the nick of time, but the stage was set for his successor to impose the Treaty of Maux upon him. As mentioned above, the Treaty of Meaux stipulated that bastide towns should not be fortified. The reason was that the advisors of the young Louis IX were intent upon reducing the risk of future military resistance to the royal authority. Even more aggressively, another clause required that the fortifications of Toulouse should be razed to the ground. Why then did the Treaty remain silent on the subject of the newly built ramparts of Montmiral and Cordes? And why five years after its signing was Sicard Alaman the chief advisor of Raymond VII of Toulouse allowed (or more likely encouraged) to found the fortified town of Castelnau de Levis? The obvious answer is that it was thought desirable to bolster the Northern Albigeois against the risk of future threats from the former crusaders, including Philippe son of Simon de Montfort, who were legally dispossessed of the lands in the Northern Albigeois and given territories to the south of the river Tarn. In addition there was the possibility of a resurgence of Trancavel power, when the children of Raymond Roger and Pierre of Aragon, his overlord, came of age. The possibility that it was an act of defiance by Raymond and Sicard seems remote for all sorts of reasons. If it had been, would Alphonse of Poitiers, King Louis IX’s brother and Raymond VII’s successor, have asked Sicard to continue in his existing administrative role when Raymond VII died, rather than dispense with his services? We might ask both, “Why so much time and trouble was being dedicated to the creating of the esplanade?” and “Why at this particular date?” The answer is that France was entering a time of prosperity after the depredations of the religious wars. This was reflected not only in the growing international influence of France but also in the aspirations of the citizens of provincial towns like Castelnau de Montmiral. In this context it is plausible to suppose that when the Montmiralais found themselves enjoying growing resources, they felt the urge to give their town an uplift and that the esplanade was a symbolic early step in doing so. It can be speculated that they felt that the visit of Louis XIII and his troops represented the royal seal of approval on their efforts. It can also be supposed that it was due to the same combination of new affluence and civic confidence that the present character of Castelnau de Montmiral owes so much to 17th century building projects. Michel Roquebert, 1995, “I’épopée cathare”, Privat. Dorothy Stenton, 1951, “English Society in the Early Middle Ages” (1066–1307), Pelican. Maurice Keen, 1968, “Medieval Europe”, Penguin. 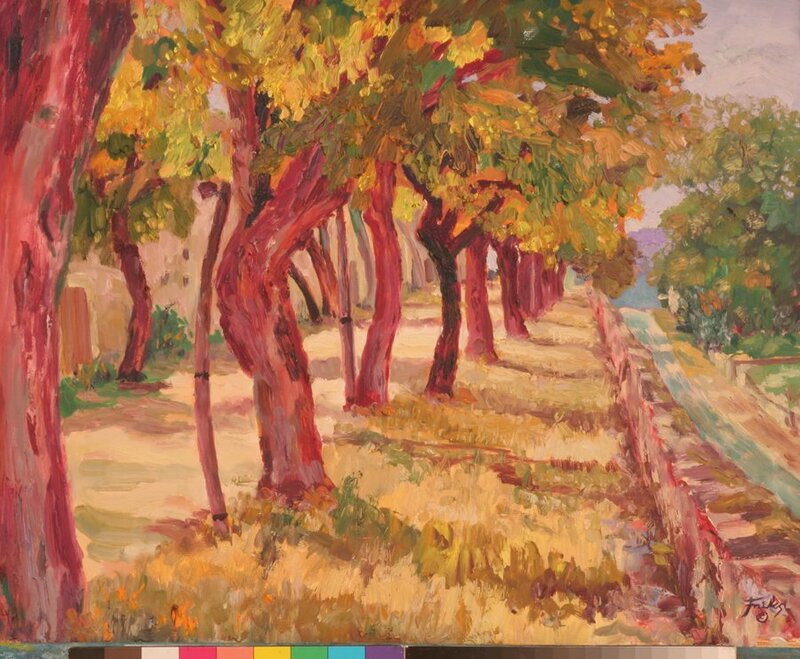 Elizabeth Hallam, 1980, “Capetian France”, Longman.